Have you ever bought a loaf of bread forgotten about it and then the next time you look at it, it is past it’s best before date? There are loads of recipes for using up day old bread – like these 20 ways to stop wasting your loaf Some of those recipes use up more bread than others and when you are faced with a whole loaf of it, you need a recipe that is more bread than anything else! Luckily melba toast is one of those perfect solutions to this problem. Once cooked and cooled you don’t have to eat it all right away either – you can store it in an air tight container for a few days, so you don’t have to speed eat your way through it! 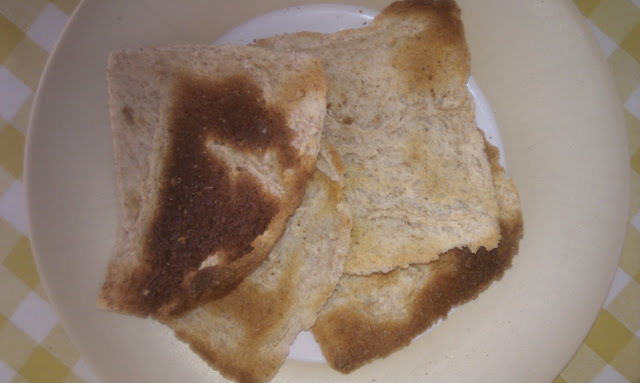 Melba toast is pretty quick and simple to make. Put in a preheated oven at a temperature of around 180 degrees. Leave for a few minutes and then turn the pieces over. Repeat the above step until the slices are browned and crispy. Make sure you keep a close eye on them so they don’t burn, but make sure they are fully dried out as otherwise they won’t keep well. Serve straight away or store in an airtight container and consume within a few days. Melba toast is delicious spread with butter, dipped in houmous, served with cheese and makes a great substitute for crackers! My kids love it as an after school snack, it would be a lovely complement to a salad and it goes down well with guests as something to nibble on if you are hosting a party! This entry was tagged bread, food waste, recipe, zero waste. Bookmark the permalink. ← 20 ways to stop wasting your loaf!